Blessing over the wine for the festival of Passover when the seder falls on Friday night. 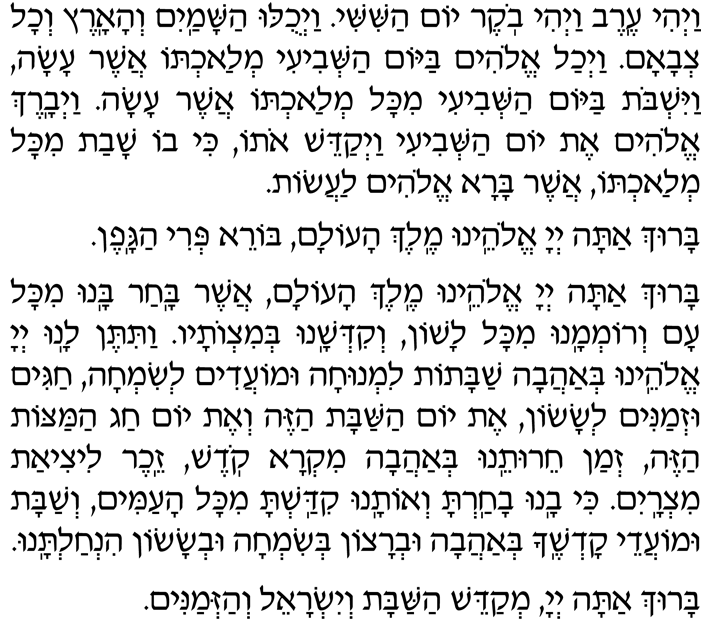 The Shehecheyanu (see below) is recited after the kiddush, immediately before drinking the wine. Download a printable version of all of the Passover Kiddush blessings. Vay'hi erev vay'hi voker yom hashishi. Vay'chulu hashamayim v'haaretz v'chol tz'vaam. Vay'chal Elohim bayom hash'vi-i m'lachto asher asah. Vayishbot bayom hash'vi-i mikol m'lachto asher asah. Vay'varech Elohim et yom hash'vi-i vay'kadeish oto, ki vo shavat mikol m'lachto asher bara Elohim laasot. Baruch atah, Adonai, Eloheinu, Melech haolam, asher bachar banu mikol am v'rom'manu mikol lashon v'kid'shanu b'mitzvotav. Vatiten lanu, Adonai Eloheinu, b'ahavah Shabbatot lim'nuchah u mo-adim l'simchah, chagim uz'manim l'sason, et yom HaShabbat hazeh v'et yom Chag HaMatzot hazeh, z'man cheiruteinu, mikra kodesh, zeicher litziat Mitzrayim. Ki vanu vacharta v'otanu kidashta mikol haamim v'Shabbat umo-adei kodsh'chah b'ahavah uv'ratzon b'simchah uv'sason hinchaltanu. Baruch atah Adonai, m'kadeish HaShabbat v'Yisrael v'haz'manim. Blessed are You, Adonai our God, Sovereign of the Universe, Creator of the fruit of the vine. Blessed are You, Adonai our God, Sovereign of the Universe, who has chosen us from among the peoples, exalting us by hallowing us with mitzvot. In Your love, Adonai our God, You have given us Shabbatot of rest, feasts of gladness and seasons of joy; this Shabbat day and this festival of Pesach, season of our freedom, a sacred occasion, a remembrance of the Exodus from Egypt. For You have chosen us from all the peoples and consecrated us to Your service, and given us Shabbat, a sign of love and favor, and the Festivals, a time of gladness and joy. Blessed are You, Adonai, who sanctifies Shabbat, Israel, and the Festivals. Blessed are You, Adonai our God, Sovereign of the universe, for giving us life, for sustaining us, and for enabling us to reach this season.